2 cats and a baby: Good Morning! Ethan has my sense of time all messed up! Ethan likes to wake up around 4 and 6am and sometimes mommy isn't able to go back to sleep. But I am not going to complain about it because it means I get some special mommy-son time just the two of us while daddy and big sister are sleeping. And when Ethan falls asleep, I have time to clean and do laundry as well as admire my sleeping children. Arms up, just like daddy. I love this little quilt. We bought it at the Children's Store at Camp Lester (near the hospital) the morning before I went into labor. The store has a lot of volunteers and they sell a lot of items handmade by other spouses here in Okinawa. We bought the quilt and a handmade nursing cover, I'll have to take a picture of it sometime as its very bright and cheery! We also bought Alison some little colored pencils that look like sticks. Ethan has this blanket and a fluffy blue blanket with a satin trim that great grandma and grandpa sent (thank you! ), I am so glad we have two blankets as this little guy spits up a lot! If you look in the next picture you'll see he has on a different outfit even though its the same morning! 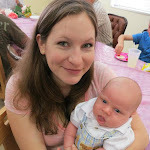 I forgot how many outfits a newborn can go through in one day! I was able to sneak into Alison's room and take a few pictures. She looked so angelic with her little hands folded and her batman pajamas on. She got her first "black eye" I don't think it's very noticeable but you can see the little bruise from where she ran right into a dresser. In her defense it was when our apartment was full of government furniture and our furniture, so it was pretty crowded in here, not exactly the environment for a two year old to run around and play in. Sweet little dreamer. Alison likes to sleep in till about 9 sometimes 10. We put her to bed around 8 to 830. When she does wake up she doesn't immediately pop out of her room or cry for someone to come and get her, instead Alison likes to quietly read her books and play with her toys. It gives mom, or recently dad, some time to get breakfast ready. Speaking of books, I recently ordered two books! Parenting books. I am a firm believer in self education. I think we have good instincts about parenting but that society interferes. Example, we think "I know TV isn't the best for my kid to sit around and watch but I don't want him/her to be left out socially" OR "I really need my kid to just sit still and be quiet" (I've been there!) making it hard to decide that TV isn't going to be part of your child rearing philosophy. Criticism from other parents as well, I've personally had people tell me I was being cruel to my child by not regularly exposing her to TV. Not that Alison is never exposed to TV, we will watch a movie together occasionally but its not the norm. Oh TV is a big example, I might have to do a post just on my TV thoughts! its nice to read books to help you develop your own child rearing philosophy and to reenforce/feel supported on decisions you've already made. I know that there are a lot of things I would like to improve on, especially establishing a rhythm in our home. I am sure as things get settled you will be able to read about our attempts at finding a rhythm (a flowing schedule) that fits our family. 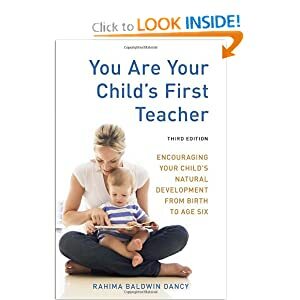 First, I am doing a re-read of "You Are Your Child's First Teacher" the 3rd edition by Rahima Baldwin Dancy. I read this book (well the first edition) when Alison and I first started taking the parent child class at the Waldorf School. I read a lot of books that were available to us in the parent lending library. I really wanted to refresh my memory with this one, which I found to be one of the better books available for Waldorf families. There is a lot of good information in this book I am sure I will be sharing more thoughts on it with you as I slowly make my way through! The other book I ordered was "Simplicity Parenting" by Kim John Payne. I have not read his book but I was fortunate enough to be able to have attended one of his lectures and it had a profound influence on the way Chris and I raise Alison. In fact the book I am currently reading says "One of the best discussions of how children develop and ways to respond by creating a sustainable home life is Simplicity Parenting by Kim John Payne." pg 7, what an endorsement! I have been wanting to read his book for awhile now but kept putting it off. After my reread I am looking forward to jumping in. At the moment my "Simplicity Parenting" book is next door being read by my mom friend. Although I don't have it, a third book that I would recommend is "Beyond the Rainbow Bridge" by Patterson, Bradley and Riordan I am probably going to do a reread of this one as well. The biggest thing I took away from this book is the relationship children have with their toys and the impact our treatment (and theirs!) have on their sense of self. This moment (Oct.3, 5am): Ethan is asleep on his boppy pillow in my lap after his 5am feeding, wrapped in the little quilt. He looks so peaceful. The apartment is quiet and its starting to look more like home as things get put away and we settle in for a 3 year stay.